Traditional Tex Mex soup is a delicious and spicy comfort meal made with vegetables, ground beef, sausage, black beans and corn. My low-carb version uses green beans instead of black beans and corn. It's a great one-pot meal that takes less than half an hour to prepare. 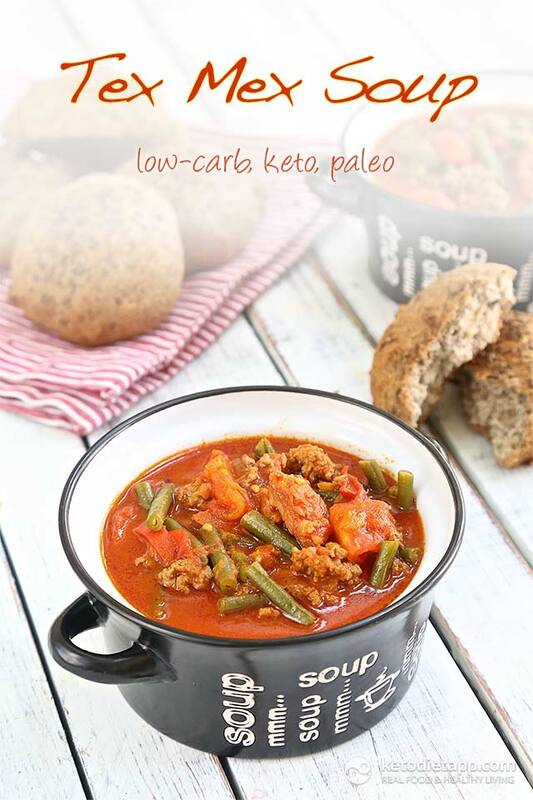 Try this hearty soup with low-carb bread such as Ultimate Keto Buns or Keto Breadsticks! Peel and dice the onion and garlic. 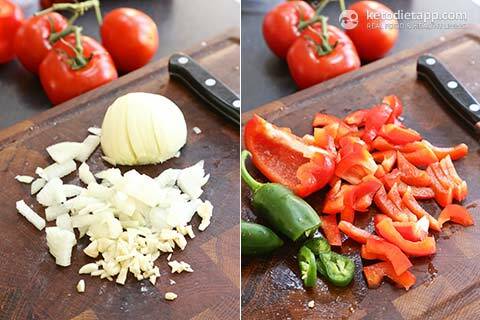 Halve, deseed and slice the red pepper and green chili peppers. 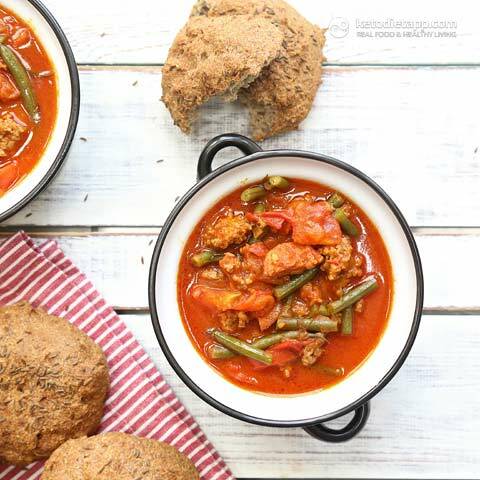 Grease a large soup pot or a Dutch oven with ghee. 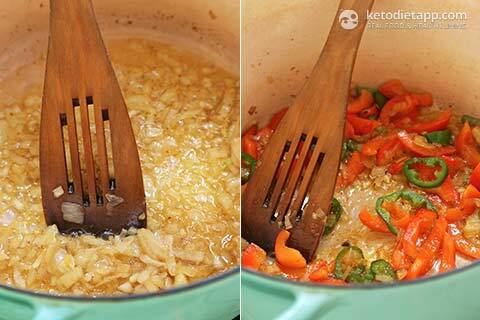 Once hot, add the diced onion and garlic and cook over a medium-high heat for a few minutes while stirring, until lightly browned. Add the sliced red pepper and green chili peppers. Cook for about 5 minutes and stir to prevent burning. 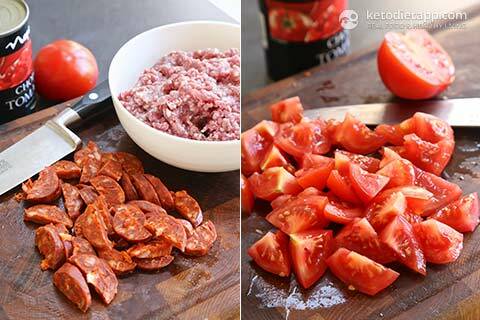 Slice the chorizo sausage and roughly chop the tomatoes. 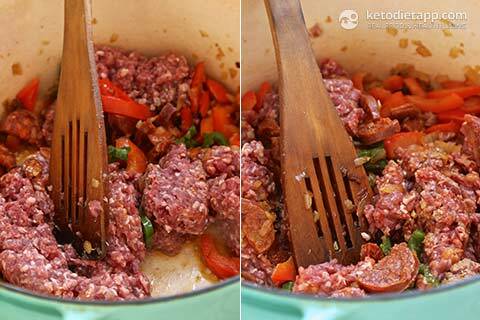 Add the chorizo, ground beef into the pot and cook until browned from all sides. 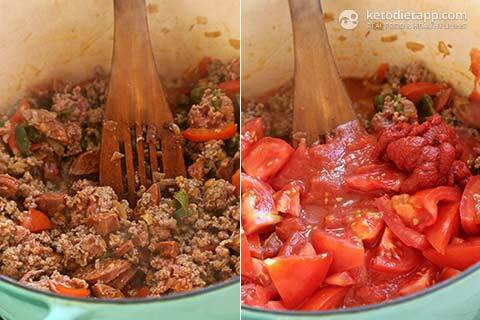 Add the chopped tomatoes, tinned tomatoes, tomato puree and Tabasco to taste. Pour in the water and season with salt and pepper. Wash and cut the green beans into thirds. 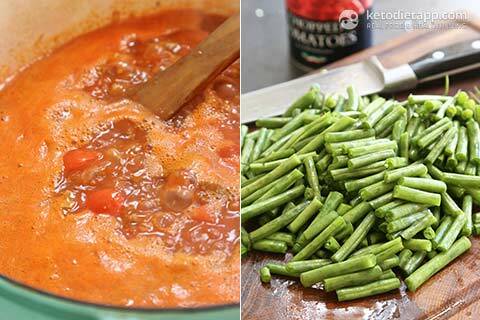 Cook the soup until you see bubbles and add the chopped green beans. 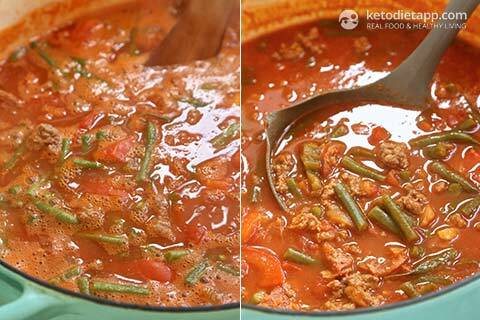 Cook for about 10 minutes or until the green beans are crisp-tender. Take off the heat. Serve hot and try with Keto Buns! Store refrigerated for up to 5 days or freeze for longer. Love your website. You might want to try eggplant instead of green beans. I have found that if you dice eggplant (peeled or not) into "bean" size pieces, fry them until tender crisp in bacon fat, and then add them to soups, chili, or stews they make a great substitute for beans. I have had guests rave about and ask about the "beans". Can't wait for the android app. I use diced zucchini as a bean replacement but I really like the eggplant idea! Martina, every time I read your blog I have to run to the store and get the ingredients and I am so pleased that I have NEVER had a flop! This soup looks delicious! I wish there was a way to pin your individual recipes to Pinterest, which is where I save most of my new recipes. Your recipes always look great, but I have no way to store them. Hi Kay, you can follow me on Pinterest: www.pinterest.com/ketodietapp/ and you can also pin from my blog. Simply hover over the images and a "pin it" button will display in the top left corner. Thank you! The buns are absolutely amazing! It's the best bread I've tried and I'm definitely making this one too. Love all your recipes!